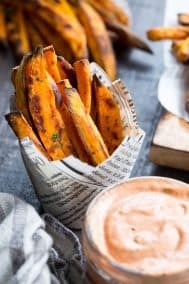 Easy to make crispy baked french fries with a spicy chipotle ranch dip that’s Paleo and Whole30 compliant! 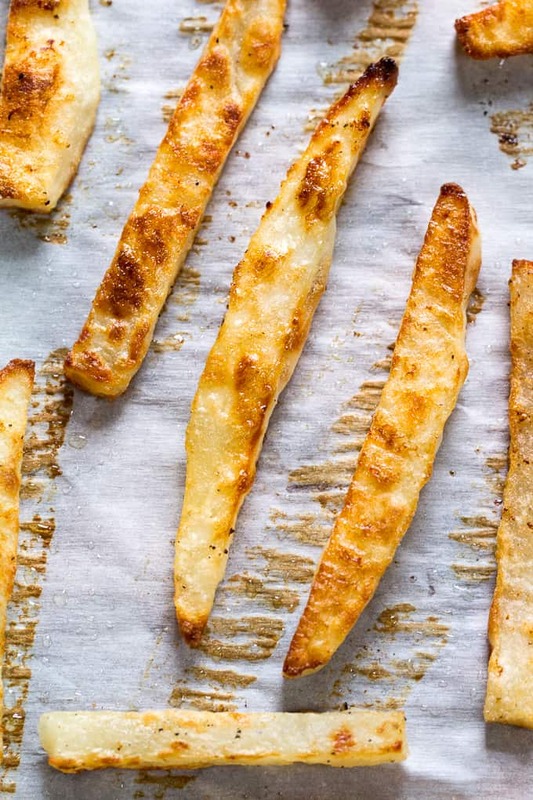 Serve these baked skinny french fries as a fun and healthy side dish, appetizer or snack. I’m declaring this the weekend of fun snacks and dips! 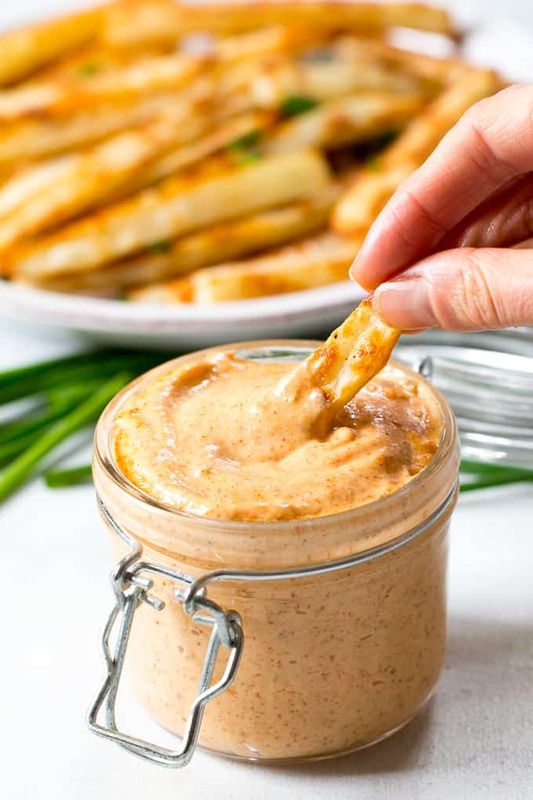 We’re starting out today with these easy baked french fries with a spicy chipotle ranch dip – the FAVORITE and most-often-made dip in my house. 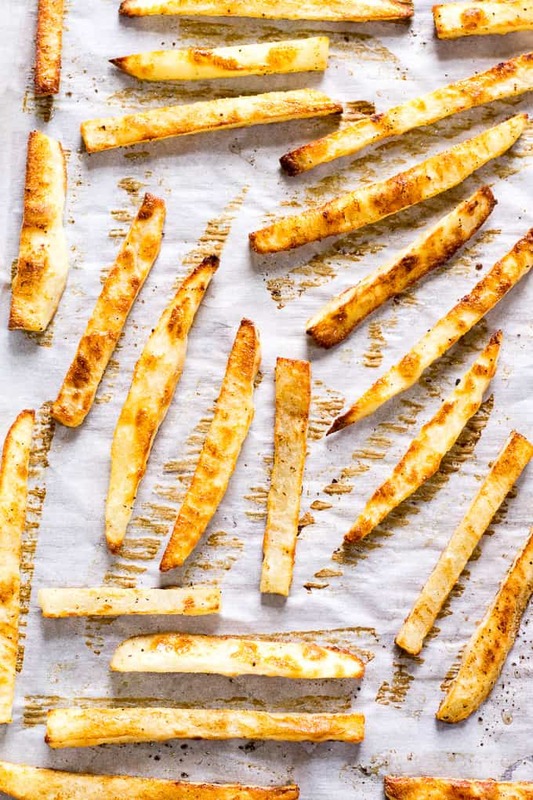 These baked french fries are, in fact, technically Whole30 friendly since they’re baked (said it again), and – Woohoo! 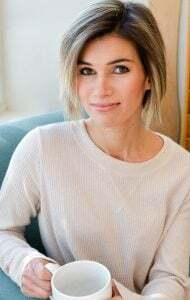 – white potatoes are now (and have been for some time now) Whole30 compliant as long as they’re not deep fried or made into chips. 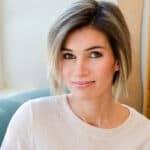 In truth, I feel I’m old and wise enough with Whole30 to “handle” these fries once in a while – and honestly – I wish I’d made them back for my first Whole30 when I was marathon training and could’ve used the extra carbs, but, white potatoes were a NO back then. So, here I am making up for lost time. Even still, I’ll only make these tops once per week (so as not to spoil anyone for actual veggies) and with a family of 5 no one really winds up with more than a handful. Just another reason a double oven would be pretty flipping nice around here! I do have “secrets” for getting my fries oven-crispy, and those “secrets” are really just simple tips that everyone with a potato and oven should know about. 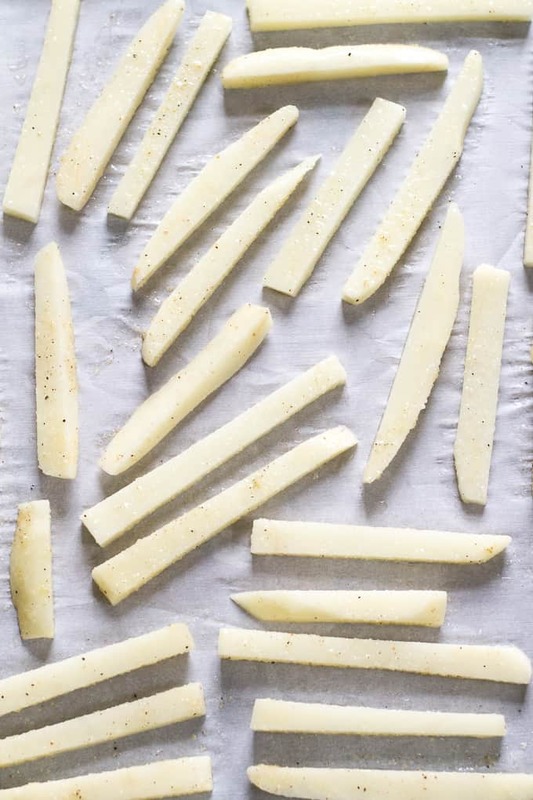 As you can see above, I always toss my fries with oil (more often than not I use light flavored olive oil) and salt before spreading out on the parchment paper. This is an extra step of course, but in my experience, it ensures your potatoes are evenly coated and the excess oil doesn’t hang out on the parchment paper getting things soggy. If you prefer tossing everything together right on the baking sheet to avoid washing a bowl (I hear you! ), that’s okay too! And this, my dear crispy-fry loving reader friends, is because the real key is just giving the potatoes room to BREATHE! Free to be the crispiest versions of you and me, you know? This step is annoying because it requires two baking sheets, and for me, it takes up my whole oven. BUT! It works and I’ll never do it any other way. My third step is sort of random but it’s been how I’ve been baking my fries for a while – I turn them over half way through and then lower the heat by 25 degrees for the remaining time. I find that the skinnier the cut, the more sensitive the fries are to burning at higher temperatures, so letting them finish off at 400 is the way to go for this long skinny fry-shape. And yes, the chipotle ranch! 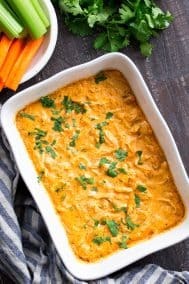 This dip goes really well with anything in my opinion – aside from dipping veggies (or the baked french fries in this case) I put it on my burgers, chicken, salads, other roasted veggies or even to top off a hash. It’s spicy but not too spicy and has a great smoky, zesty ranch flavor. Are you guys ready? Oven preheated? I know you’re going to love these, guys – let’s go! Easy to make crispy baked french fries with a spicy chipotle ranch dip that's Paleo and Whole30 compliant! 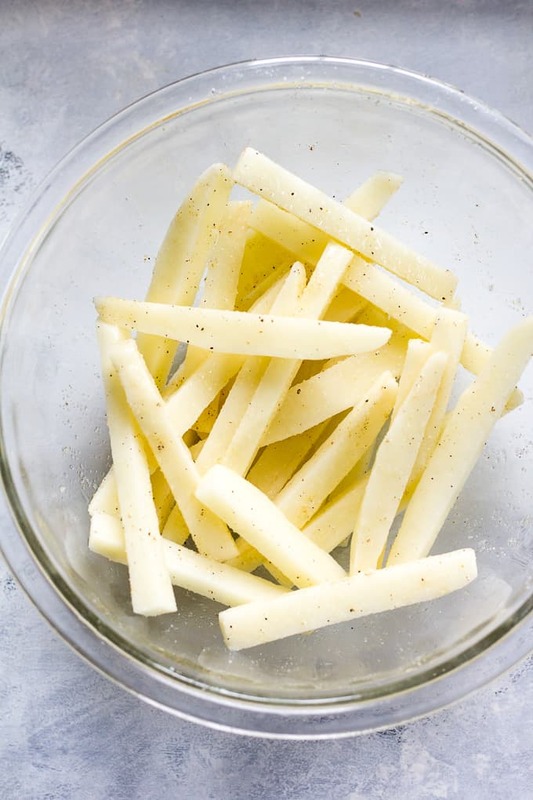 Serve these baked skinny fries as a fun and healthy side dish, appetizer or snack. 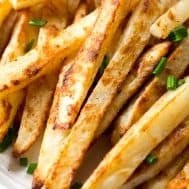 Cut your potatoes into 1/2 inch "fries", then pat them dry on all sides with paper towels to absorb as much moisture as possible. Put the fries in a large bowl and toss evenly with the oil, salt and pepper, and onion powder if using. Make sure the fries are evenly coated with oil. Spread out the fries on the two parchment lined baking sheets with at least 1/2 inch of space around each one. More space ensures crispier fries! Bake at 425 for 20 minutes, turn them over (or shake a bit to turn as many as possible), lower the heat to 400 and continue to bake another 20 minutes or until golden brown and crispy. While the fries bake, make your ranch! 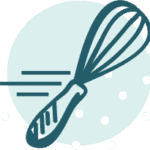 Whisk together all ingredients in a medium bowl and refrigerate until the fries are done. Serve with the hot fries and fresh chopped chives if desired. The chipotle ranch is also a great topping for burgers, chili, chicken, almost anything! Enjoy! This recipe will make 4 servings of fries and lots of extra dip. Store leftover dip in a tightly covered container in the refrigerator for up to one week. *I always use my homemade recipe that's ready in just 1 minute using an immersion blender! Want more healthy baked fry recipes? Try one of these! Do you have a favorite dip/sauce lately? 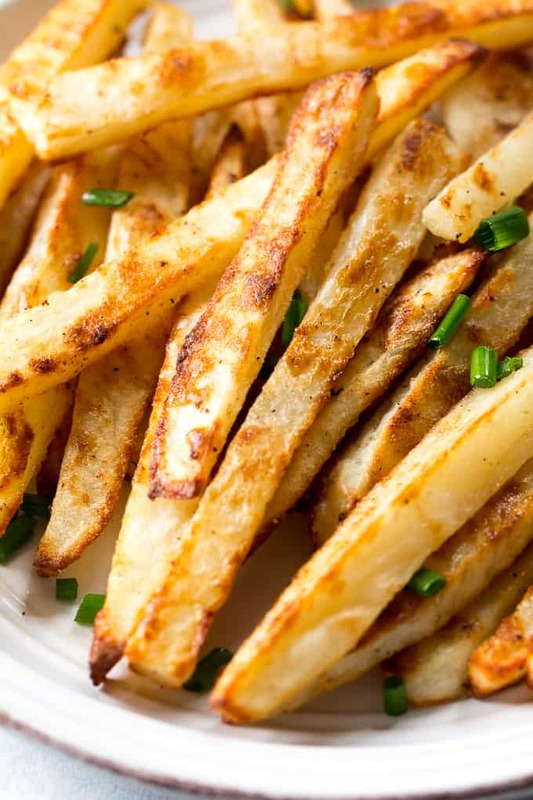 What are your secrets for crispy baked fries? Note: This post contains affiliate links. This means that if you click on a link and make a purchase, I will receive a small commission at no cost to you. Thank you for supporting The Paleo Running Momma! Yummy! I’m making these today except not sure I can get the chipotle unless I order it. Wow these are beautiful and so yummy looking. That’s so cool that white potatoes are now Whole 30 compliant! I love that white potatoes have finally made the cut (seriously, there was no reason to ostracize my beautiful spuds), although I don’t like how there is still stipulations. Eat them this way, but not that way. I will eat fries any way because they are delicious and even more so when paired with chipotle ranch. I have to say, this is the BEST spicy mayo I have made. I’m eating it right now with your oven baked sweet potato fries. 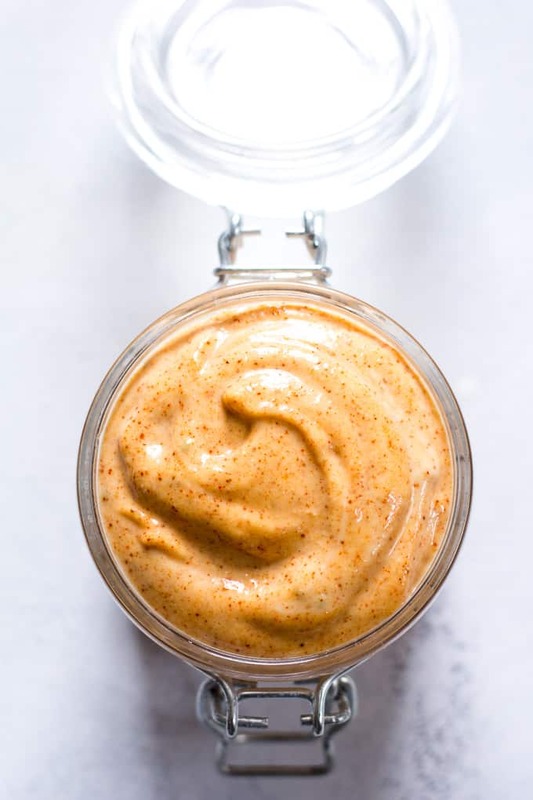 Your homemade mayo recipe is so much better than the others I have tried. Not too much olive oil, but a little extra mustard. Perfect! Now for the change… I just used premixed Cajun seasoning, with a little extra chipotle powder, instead of all the other dried spices. Would coconut oil work well with this? 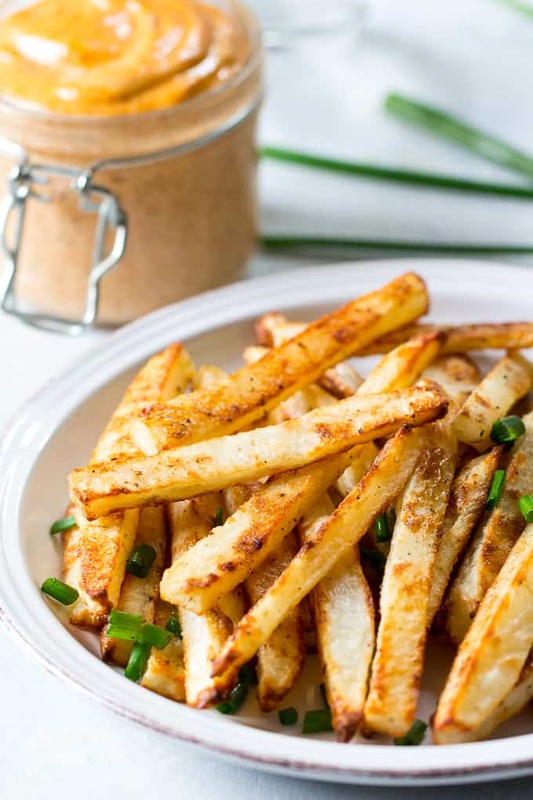 You can definitely use coconut oil to bake the fries, not for the dip though. Oh my goodness! This sauce is outstanding! I had to use dried Cilantro because I didn’t have dried chives and it turned out wonderful. I will definitely put dried chives on my next grocery list though. Thank you for this recipe!!! It’s definitely one of my favorites too, I come back to it and use it all the time! So happy you liked it! Use a silicone mat and they won’t burn or stick. Parchment is worthless for me. Very uneven and half stick to it. I just use extra virgin olive oil and pink himalayan salt with a sprinkle of pepper and garlic powder. Delicious and I don’t need dip. It’s way too much in the way of caloric intake as it is even with a small amount of oil. Sounds good, though. What type of parchment do you use? I’ve never had an issue with anything sticking to parchment. There is a Primal Kitchen Chipotle Lime Mayo. Have you ever used it with this dip? Also, how long do you keep in the refrigerator after making the dip? Thanks! 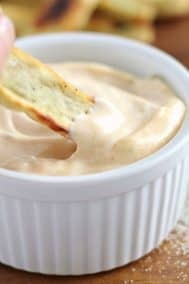 Love the chipotle ranch dip!! So good with the burger & fries we had last night for dinner and of course so good with the Mexican Califlower Fried Rice meal!